"Through the Darkness of Despair"
There was a smog so thick hanging over Anfield in 1959 that the roof of the famous Kop could hardly be seen, but in the back seat of a car in Manchester, a Ray of Hope was rising. Mr TV Williams had driven there to meet a certain Mr William Shankly. Bill had applied for the Liverpool job in the early 50’s but had failed to impress the board that he was the man for the job. Luckily for us Mr TV Williams had seen something that the others seem to have missed, “one of the biggest hearts in the game”. In those days the team selected to play had to be approved in the boardroom before it was announced and once this hurdle had been removed Shankly signed on the dotted line. On arrival at Anfield he found a run down ground, where the wind rattled through the corrugated roof of all parts of the ground, but worse was to come. The biggest shock came when Bill inspected the training facilities at Melwood. Nessie recalled Bill saying, 'Oh Nessie have I made a terrible mistake leaving Huddersfield?' He thought that coming to Liverpool was a big mistake because of the conditions at the training ground. The shack that was the changing rooms were worse than that on many parks for Sunday league teams and the pitches were full of bricks, stones and broken glass. 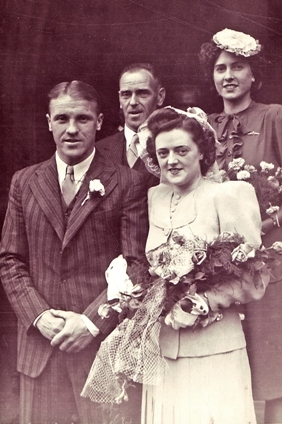 Shankly and Nessie getting married on 29th of June 1944. Together with Paisley, Bennett, Fagan and the groundsman Eli Wass the five men set about their task. They walked abreast and by hand picked up every stone and foreign object from the playing surface. After walking up and down the pitch 12 times, Bill decided that that was enough for the first day's improvements, but would return again and again until it was like a bowling green. Shankly’s thoughts at the time must have been grave, how can anyone expect a club to improve if they couldn’t provide facilities to equal a Sunday league team? But this is what welcomed Bill on his arrival. Bill had also joined a club, where the main star, the incomparable Billy Liddell, was only a part time player and coming to the end of his illustrious career. He would need to sign players and sign them quickly. He approached the board for money to buy a young Jackie Charlton, but was unsuccessful. He approached the board for money to buy the Scottish midfield dynamo Dave MacKay, but was unsuccessful. Shankly had been assured by the board that they were as ambitious as he was to improve the clubs standing, but this was not proving to be true. Bill's first season came to an end with a spirited end of year rally seeing them finish third in Div 2 - not bad considering where they were when he took over in December. Shankly’s first full season saw them finish in exactly the same position, so near but yet so far. Coming third in the second division was a fate so cruel it often brought tears to the eyes of fans, who wondered how long “The Darkness of Despair” would last. Shankly was already showing signs of desperation, he needed a benefactor who would not run away from signing cheques, they didn’t need to fill them out, Bill could do that, all they had to do was SIGN THEM! Fortunately for Bill, that time was not that far away. Eric Sawyer an accountant with Littlewoods Pools had been nominated by John Moores for a place on the board and if Eric had one skill that Liverpool needed, it was his ability to sign his name. The Liverpool boss could now spend the summer of 1961 looking for the ammunition that would fire Liverpool back to the top league, but he would still have to face the shareholders before the new season started, not something our Bill liked doing. The meeting started in the worst possible way. Bill had only been here for 18 months and a part of the shareholders were already after his head. Bills heart sank, what on earth had he let himself in for coming here. “Solly” the leader of the lambs was not content, he again took a snipe at Bill and TV. “The manager and board should have taken steps to prevent the players from stopping to play half way though a game, no employer just lets his workers knock off when they feel like it” This time it was TV’s time to erupt, “You’re talking nonsense and quite frankly how would you know” TV and Bill had been minutes away from a vote of no confidence. One thing Bill was beginning to realise, if his latest signings of Yeats and St John did not pay immediate dividends, he was in trouble. Bill had every faith in the fans, but the board and shareholders were proving to be another matter. The signing of Yeats was going to prove invaluable, but to convince him to sign was going to prove difficult. Enter the Bill we all know and love. Big Ron Yeats asked “whereabouts in England is Liverpool”. Prophetic words indeed, no wonder players believed every word Shankly uttered. Within months of Yeats' arrival, he was appointed club captain, Shanks’ Red Collosus was to lead his new look team out. Shanks commented “Christ son, you’re so big that when you lead the team out, you’ll frighten the opposition to death”. Shanks was telling everyone who would listen, that this team would win promotion. My Dad and many other Dads came home bladdered that night, I remember little of the night, but remember me Dad was so out of it, he couldn’t undo his own shoelaces. He fell asleep on the couch dreaming of what was to come. Shanks comment on the day, “I believe Liverpool are on the threshold of greater things”. He also praised the efforts of his back room staff Reuben Bennett, Bob Paisley, Albert Shelley and Joe Fagan who were to form the basis of the coming “BOOT ROOM” philosophy. Not only had the players began to believe his every word, the fans were announcing the arrival of the new messiah, now all Shanks had to do was convince the board & shareholders. The only comment I would like to make at this time, comparing those days with today, was that Bill had a line and a quick retort for every situation that could arise. He had a way about him that made everyone within ear shot beieve he had all the answers. We were not only going to be playing in the first division next season …… Bill had everyone believing we were gonna win it! And as for the missing FA Cup that had never seen the inside of the Liverpool trophy cabinet, Bill was suggesting we better make room for it now. Pride, dignity and faith were becoming the new watch words around the hallowed halls of Anfield, and everyone believed! "I've been a slave to football. It follows you home, it follows you everywhere and eats into your family life. But every working man misses out on some things because of his job."